easyBus, in partnership with National Express coaches offers an airport transfer bus service between London Luton Airport and Paddington via Golders Green from only £2.99 one-way when you book in advance. easyBus passengers accompanied with a print-out of their ticket should board the National Express (A2) route towards Paddington from the Luton Airport Coach Station. The Luton Airport to London Victoria transfer offers customers a variety of further travel connections throughout the entire route. easyBus customers can therefore take advantage of our fantastic low fares and travel directly and quickly to several stops within central London. easyBus prices start from only £2 one-way and with average fares of little more than £6, all our customers get great value for money. The standard rail fare is £15.50! Remember the earlier you book the more you save. Luton Airport does not have a train station, hence customers wishing to catch the train to/from London need to also take a time consuming shuttle bus between the airport and the train station. Bus and coach operators arrive/depart immediately outside the terminal building, and offer direct services to/from central London. No changes, no hassle and no carrying suitcases around. Coaches take only 40 minutes to travel between Luton Airport and Golders Green, on the northern line, and 50 minutes to travel between Luton Airport and Finchley Road, located on the Jubilee and Metropolitan tube lines. Customers can therefore travel very quickly between Luton Airport and central London. The other stops, Baker Street, Marble Arch and Victoria coach station are centrally located and also offer many onward travel options, including access to the Jubilee, Metropolitan, District & Circle, Victoria and Bakerloo tube lines and over ground services from Marylebone and Victoria stations. Ideal for travel to/from north-west, central, south and south-east London including areas such as Maida Vale, Paddington, Lancaster Gate, Knightsbridge, Kensington, Westminster, Sloane Square, Clapham, Stockwell. Please note travel is via National Express coach. Book through our website as normal, print your ticket, and then ensure you board a National Express coach. These depart from Stop 10 at Luton Airport, which is located immediately outside the terminal building. 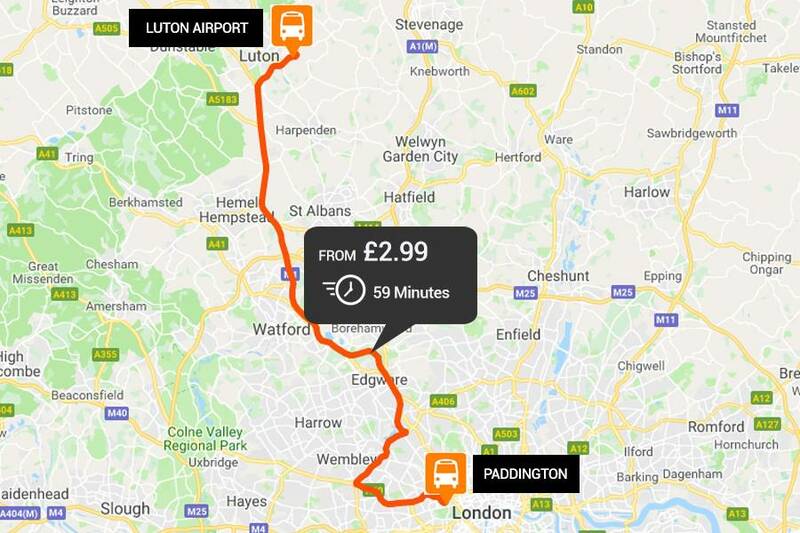 For passengers travelling to Luton Airport, easyBus recommends that you arrive at the airport at least 2 hours ahead of your scheduled departure of your flight. When travelling from the airport, easyBus recommends booking a service at least 60 minutes after the scheduled arrival time of your flight. Don’t worry, if your Luton flight arrives early or late, you may use the same ticket at no extra cost to travel on the next available Luton Airport departing bus, up to 60 minutes either side of your booked time. Please note we cannot guarantee there will be spare seats, since passengers travelling on their booked service have priority.